In May 1953, while in the company of his wife and a physician friend, Aldous Huxley took four-tenths of a gram of mescaline. The mystical and transcendent experience that followed set him off on an exploration that was to produce a revolutionary body of work about the inner reaches of the human mind. Huxley was decades ahead of his time in his anticipation of the dangers modern culture was creating through explosive population increase, head-long technological advance, and militant nationalism, and he saw psychedelics as the greatest means at our disposal to "remind adults that the real world is very different from the misshapen universe they have created for themselves by means of their culture-conditioned prejudices." Much of Huxley's writings following his 1953 mescaline experiment can be sen as his attempt to reveal the power of these substances to awaken a sense of the sacred in people living in a technological society hostile to mystical revelations. 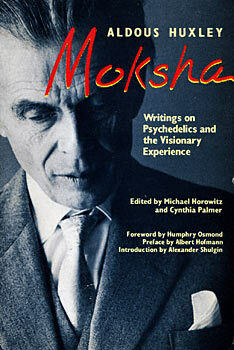 Moksha, a Sanskrit word meaning "liberation," is a collection of the prophetic and visionary writings of Aldous Huxley. It includes selections from his acclaimed novels Brave New World and Island, both of which envision societies centered around the use of psychedelics as stabilizing forces, as well as pieces from The Doors of Perception and Heaven and Hell, his famous works on consciousness-expansion. Also included are magazine articles, interviews, letters, and scientific papers that vividly demonstrate the evolution of his ideas and offer an engrossing record of the journey. Michael Horowitz and Cynthia Palmer are the directors of the Fitz Hugh Ludlow Memorial Library in San Francisco. Michael Horowitz was Timothy Leary's archivist and is coauthor of The High Times Encyclopedia of Recreational Drugs. Palmer and Horowitz live in northern California. "Moksha is more than a book about psychedelics --although it may well be the most intelligent, well-rounded one of its kind. It is also another chance to spend hours in Huxley's fascinating company as he talks about art, literature, religion, psychology, and ecology." "A remarkably stimulating, worthwhile volume." "The final chapter, climaxing in Laura Huxley's description of her husband's death, is one of the most transfixing pieces of reportage I've ever read."